Visitor I Carp sent a photo that appeared on page 18 of the New York Times the other day showing the new structure on the west side of the West Wing that, I believe, is a cover concealing work on the above-ground part of new underground parking and security facilities. I don’t think we’ve had any official announcement on this; but this is almost certainly going to be torn down eventually to reveal the “real” building constructed inside it. HuffPo (warning: politics) has a slide show of Camp David. 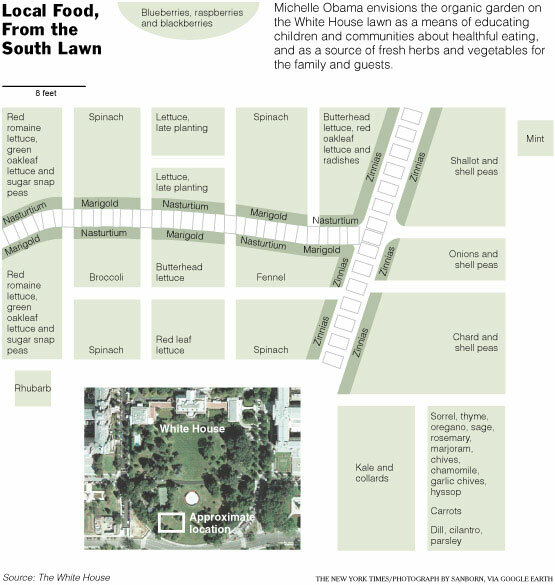 The New York Times reports that the Obamas are digging up a patch of the far south lawn (within view by the public) to plan a victory garden of sorts. 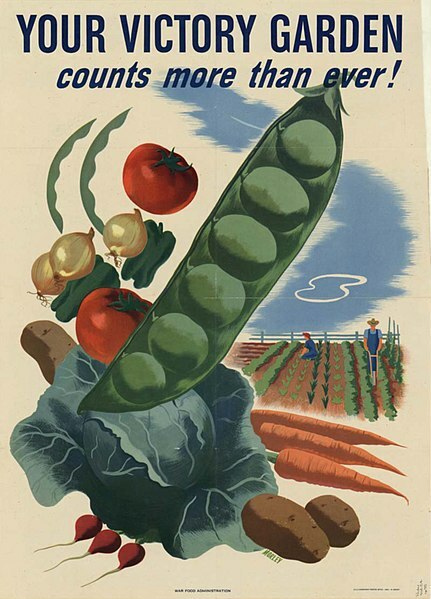 The White House kitchen staff has long harvested plants for spicing and flavoring the first family’s meals, but this will be a full-fledged vegetable garden since Eleanor Roosevelt’s during WW2. Bonus: In that same article, we also finally got a great new photo of the Kitchen Pantry. Woo hoo! 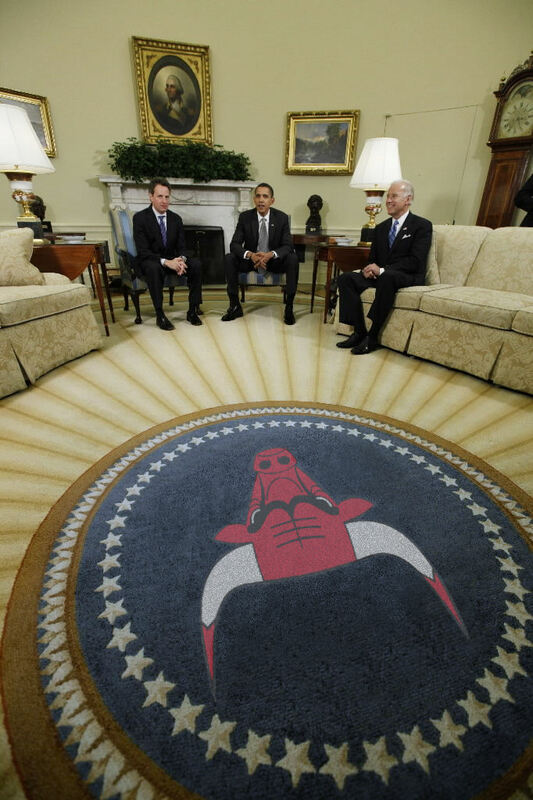 Perhaps emulating FDR, Barack Obama is seen here planning maneuvers in the Map Room. For those interested, the presidential NCAA basketball bracket is available in high resolution here. I got a question from a chef writing a paper on “meals served to kitchen works in previous administrations from approximately 1800-present.” From the materials I’ve read, there is very little indication of what the staff ate. My guess is that it’s rarely recorded, altho some hint may be obtained from some of the WH cookbooks that have been published. The only anecdote I can think of is that the staff used to pour the remainders of the alcoholic drinks after a party into a basin and add fruit juice to make a nice punch they would share. Visitor James sent a link to an interesting article and series of photos [warning: language] that explores the president’s electronics. 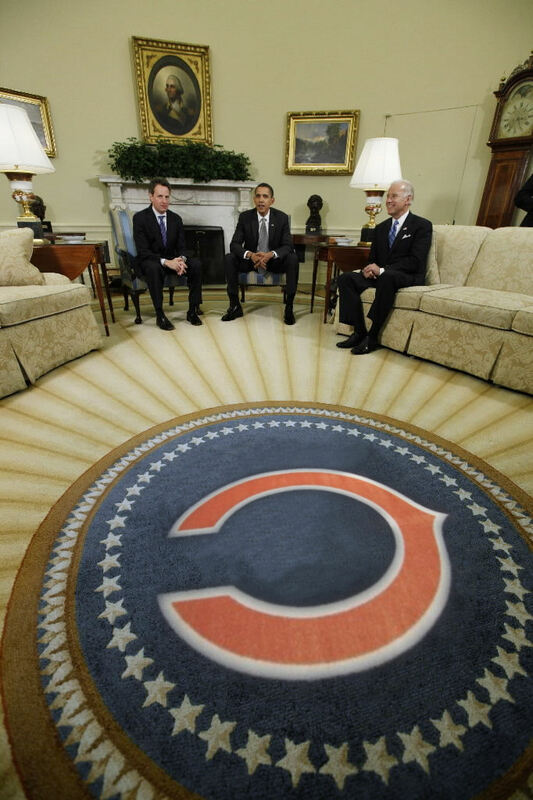 UPDATE: Per the discussion, here is an artist’s rendition of what a good potential Obama Oval Office rug might look like. Visitor Seth passed along an interesting article on a newly-discovered photograph of Abraham Lincoln standing in front of the WH, found in the personal album of US Grant. It’s probably the last photo taken of him alive, but just as important it shows us exactly how Lincoln looked from 200 feet away and slightly blurry. It also suggests that Lincoln was a bit of a braggart, having erected a red post on the north lawn labeled with his 6′ 4″ height. I’m glad this didn’t become a tradition or we would have them scattered all over the grounds by now (and you know Taft would have added a hoop to his to indicate girth).